After silver filigree work, Khannagar- Khapuria Puja Committee is now turning to gold for beautifying Goddess Durga. CUTTACK: After silver filigree work, Khannagar- Khapuria Puja Committee is now turning to gold for beautifying Goddess Durga. This year, Devi will be adorned with a gold crown weighing around three kg. 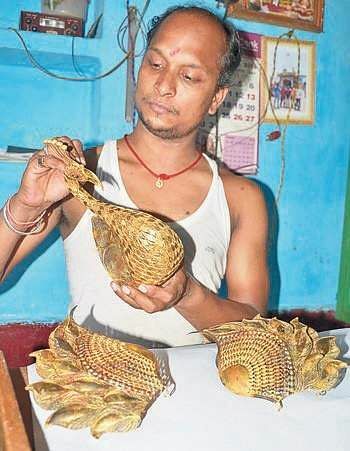 Renowned artisan Biswanath Dey of Sheikh Bazaar and his associates have been engaged in designing the crown with exquisite filigree works for more than a month. They are engaged in giving finishing touches to the crown. After Choudhury Bazaar, Sheikh Bazaar, Ranihat, Mangalabag, Kathagada Sahi and Chauliaganj, Khannagar-Khapuria Puja Committee will be the new entrant to the elite 'Suna Mukuta' club in the Silver City. However, the backdrop will be made with the exquisite silver filigree. Sources said residents of Khannagar and its adjacent areas had started celebrating Duga Puja by worshipping a clay idol of a fivefaced Lord Mahadev inside a thatched house in 1952. Locals, who worshipped the idol of Goddess Bagalamukhi for some years, have been worshipping Goddess Durga since 1962. In 1980, a concrete puja pandal was constructed by the committee for festival. Residents of Khannagar, Netaji Nagar, Arunoday Nagar, Ghatakula, Surya Vihar, Kali Vihar and Malachandia Chowk have been participating in the celebration at Khannagar-Khapuria puja pandal. The committee became a member of the elite 'Chandi Medha' club by designing a silver tableau for the Goddess in 2011. The committee has also created a special identity of its own by erecting attractive and colourful gates with varied themes each year. "This year, we are constructing a welcome arch near our pandal replicating Baba Harbhajan Singh temple located near Nathu La border in Sikkim," said committee secretary Prafulla Kumar Sahu. The construction work of the gate was hampered for the last three days due to cyclone Titli. However, the gate work is going on in full swing from Saturday with engagement of additional manpower to complete it in time, he added. The committee has also decided to distribute curd rice among devotees on Dussehra day. "This year, we have made a budget of `20 lakh for celebration of Durga Puja," Sahu informed.